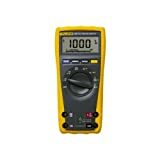 The trio 170 Series is widely regarded as being among the most useful digital multimeters for general purpose, industrially-based and field-based electrical testing. Highly responsive, True RMS meters, they set the standard for speed, responsiveness and accuracy. Very easy to use and rugged at the same time, they have sharp displays and incorporate the level of input safety that people expect from upper end Fluke devices. The 179 has the most features and usefulness of this series. It does everything the 177 can do, has the same high level of accuracy and also comes with a temperature input. Although not a wide temperature range (-40°C to 400°C), this useful addition swings it for many. 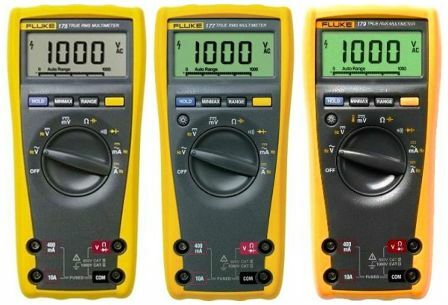 Differences between the various models in the Fluke 170 Series comparison are pretty clear cut. These are not hugely complex multimeters and there are just a few main differences. With the 175, you get a very good, all-round meter with an acceptable level of accuracy and functionality. It would be fine in most situations at work and around the home. While the 175 is an excellent DMM, the addition of a display backlight would be a big deal for those working shifts, for example. Both the 177 and 179 have a backlight, plus they also offer better accuracy. 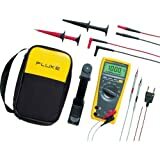 Finally, with a temperature range, the Fluke 179 offers the most functionality and comes with a complementary Type-K probe (thermocouple). Alternatives: the equally popular 110 Series – albeit with less in the way of durability and responsiveness – offers a cheaper option across various fields, including HVAC. The 80 Series, meanwhile, has greater functionality and accuracy again, though these are more complex and heavy duty.